I think that it's important to remember to be kind to people and all living things, not only this time of the year but all year 'round. I'm not saying that you should give all of your money to charities or give up all of your worldly possessions but to just remember that not everyone has it as good as you do right now. And simple acts of kindness do go a long way in this cold and uncaring world sometimes. My mother used to tell me, "I felt sorry for myself because I had no shoes until I met a man who had no feet." I would laugh about the absurdity of such a statement until I got older, then I realized what it really means. Its not that I consider myself a spiritual or religious person because anyone that knows me knows I believe that's a suckers bet, but I do believe that what comes around does go around and karma does have its way of finding you no matter where you hide. because I sometimes care more about animals than I do people but because I believe that if we can not show compassion and empathy for the lowest of creatures how can we do so for our fellow human beings? I try not to be in such a rush all of the time, and remember that there are others on this planet just trying to get along. Sometimes its the simplist of things like saying "thank you" when someone holds the door for you at the local coffee shop or even just a smile and direct eye contact that can make another person's day. 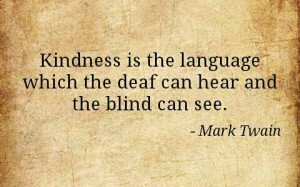 I have always believed that Kindness is contagious and its something that everyone should catch. Follow Jaded's board The Jaded Mage on Pinterest. 2017. Awesome Inc. theme. Powered by Blogger.